Red Bull Speed Street events in April featuring former F1 driver David Coulthard will mark the first time that Orchard Road and Jalan Bukit Bintang will be closed for a motor sports event. The month of April promises to be a mouth-watering one for motor racing fans in Singapore and Malaysia as they will get to take in not just one but up to three Formula 1 events within these shores. Besides the annual Malaysian Grand Prix, which falls on 10th April this year, F1 fanatics will also have the opportunity to take in two Red Bull Racing F1 showcar events on 3rd April and 24th April in Kuala Lumpur and Singapore respectively. Both events will feature former Red Bull Racing driver David Coulthard who will be giving a demonstration of the awesome power of a Formula 1 car along both famous thoroughfares and will be organised by Spectrum Worldwide, the event management company responsible for organising iconic events such as last week’s massively successful OCBC Cycle Singapore and the 2010 Standard Chartered Marathon Singapore. The last time that a Red Bull Racing showcar performed in Singapore was back in February 2008 as a special item in that year’s Chingay Parade. It was the first time that the Singapore public had experienced the thunderous engine note of a F1 car, months before the inaugural Singapore night race took place in Marina Bay. But even then, it was a mere sneak peek as the F1 car segment lasted barely five minutes before the Chingay Parade proper. 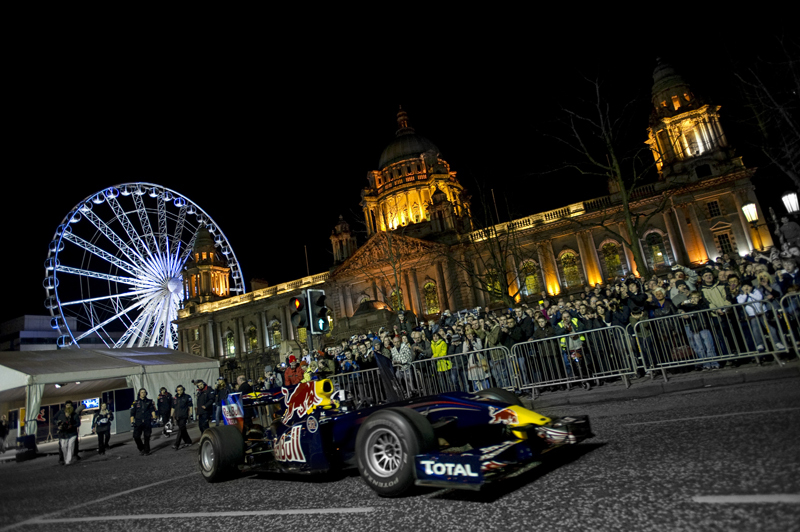 This time round, the Red Bull Speed Street events will be fully fledged standalone showcar events lasting about an hour each, in which the public can expect manoeuvres such as short sprints, burnouts, engine breaks and donuts, which one won’t get to see often in actual F1 races. This will mark the first time that Red Bull is organising a F1 showcar event in Malaysia as the blue and silver Red Bull was previously unavailable for sale in the country. The showcar event in Malaysia will take place along the entire stretch of Jalan Bukit Bintang starting from the Pavillion Mall to the Jalan Pudu junction, while the Singapore event will stretch from the Orchard Link junction to the Buyong Road intersection near the Istana. The Austrian energy drink company, which is fast gaining in popularity amongst F1 aficionados thanks to the double championship winning feat of Red Bull Racing in 2010, is expecting crowds upwards of 100,000 spectators to line the 1km stretches along both shopping streets. To ensure that the safety of the audience is not compromised, safety measures and precautions will be in place in accordance with Red Bull Racing’s safety team. A series of pre-event activations and tie-ups with retailers and malls in both countries can also be expected in the lead up to the events. Red Bull is also working closely with Singapore Grand Prix, Singapore Tourism Board (STB) and Orchard Road Business Association (ORBA) to organise the event in Singapore.